Let’s face it, despite the progress in technology and the existence of high-powered equipment, construction sites, farmlands, police operations, battlefields – any job that would require physical or manual labor will require able-bodied men to complete tasks. Us men need our feet protected. No matter how robust and well-built they are, we are all still made of vulnerable bones and flesh that are easily broken or damaged. One wrong turn could mean an injury so we owe it to ourselves to ensure prepare our safety. That doesn’t only mean wearing hard hats and protective clothing. There’s more. You also need a good pair of working footwear that would “help you stay upright, even in the toughest of times”. We have compiled the top 11 Best Work Boots to help you determine what would best protect your feet, that goes along with choices for the most comfortable safety work boots. When you work a heavy-duty job, you need a pair of boots that is just as heavy duty and can easily stand up to the test. The Caterpillar Men’s 2nd Shift 6″ Steel Toe Boot is that boot. With these boots you are getting a combination of both style and functionality thanks to the total leather composition. These shoes feature two layers of fastenings to ensure a comfortable and snug fit around the ankle and the foot without restricting your range of motion. The shaft of this Caterpillar Men’s 2nd Shift 6″ Steel Toe Boot measures six inches from the arch, and comes with a heel that measures 1.25 inches. The platform of these boots measures a nice height of .75 inches so that you won’t have to worry about your step feeling unnatural. The ankle cut Caterpillar Men’s 2nd Shift 6″ Steel Toe Boot features a steel toe that can protect your feet as well as a padded ankle area and an oil-resistant outsole. If you want a work boot that provides all of the functionality you need at work but with twice as much style, look no further than the Danner Men’s Bull Run 6” Work Boot. This work boot has a stylish profile and a short, yet supportive ankle that provides a handsome silhouette. The boot is made out of rich brown leather with a tan sole that offers you a fashionable alternative to a standard boot. The shaft of the Danner Men’s Bull Run 6” Work Boot measures 6 inches from the arch of the shoe, providing you with plenty of comfort and support around the ankles without restricting your range of motion. The Danner Men’s Bull Run 6” Work Boot has a full grain leather upper that is durable, heavy duty and is oiled for richness. Inside, there is OrthoLite footbed cushioning that provides you with the utmost comfort with every single step you take at work. Made in a classic style, the Red Wing Heritage Iron Ranger 6-Inch Boot is a boot that looks good on or off the job site. The boot is made up of natural leather that ages handsomely as time goes on. The boot features a comfortable six-inch shaft height that provides plenty of the necessary support around the ankle with none of the restriction of your full range of motion. Its striking stitching adds depth to the look. It features a bump in the front of the toe, allowing the wearer of the Red Wing Heritage Iron Ranger 6-Inch Boot a more comfortable step. The heel of this shoe measures only 1 inch in size, making it so you are not walking with an unnatural or uncomfortable step. The soles are designed to provide you with excellent traction, able to stand up to the test, no matter what sort of job it is you are performing in an outdoor, messy setting. Get the style and functionality that you crave with the help of the Timberland PRO Men’s Pitboss 6″ Soft-Toe Boots. These boots come made of full grain leather that has been oiled for richness and longevity. The smooth leather lends its way to the lacing, which is designed to tighten around your foot without being uncomfortable. The ankle area of the boot features speed-lacing designs that allow you to get into and out of the boot in no time at all. The shaft of the Timberland PRO Men’s Pitboss 6″ Soft-Toe Boot measures around six inches from the arch, providing coverage of the ankle that will deliver the support you need without inhibiting your range of motion. The collar is also padded to further that support. The rounded toe is soft and spacious to provide you with more room inside as you step on the cushioned insole that comes included with the ultra comfortable Timberland PRO Men’s Pitboss 6″ Soft-Toe Boot. Stylish and comfortable, the Thorogood Men’s American Heritage 804-4200 6-Inch Steel-Toe Work Boot is a boot that sits at the intersection of performance and fashion. This boot is made out of leather from top to bottom on its exterior. The leather has been stitched with durable accent threading that provides it with a more modern upgrade on a classic style of booth. The shaft measures around 6.5 inches from the arch, which delivers plenty of support and comfort to the ankle. Because of its unique design, you won’t have to worry about losing total control of motion when you walk, turn, twist and bend around the ankle. The Thorogood Men’s American Heritage 804-4200 6-Inch Steel-Toe Work Boot has a crepe sole that makes it comfortable to walk on. The traction is unmatched, providing you with excellent footing in any sort of work environment whether that means mud or ice. It comes with a dual-density, shock-absorbing footbed that will cushion you with every step. Classically designed, the traditional Timberland PRO Men’s Rigmaster Steel-Toe 8″ Waterproof Work Boot is an ultra supportive, high rising boot that provides you with all of the stability that you need to get your job done comfortably. This boot is a mid-cut work boot that has a 7.75-inch shaft rising from its arch. This provides total stability and support to your ankles to help lessen the chance of a twist or a sprain. It features a waterproof leather upper that makes it ideal for you to work in rain and snow environments without fear of water getting into your shoe and soaking deep inside of it. The steel toe design will help protect your toes from any falling objects or other threats to your feet while you’re at work. Its rubber sole has plenty of traction, and the heel measures only 1.5 inches in size. The platform measures 1 inch as well for a comfortable, more natural-feeling step. With plenty of padding along its ankle, the Carhartt Men’s CMF6366 6 Inch Composite Toe Boot is an ultra supportive boot that supports and stabilizes not only the ankle but the arch of your foot as well. The tongue of this boot has also been padded for comfort from top to bottom. This boot is made out of 100 percent leather and features an ultra thick sole that has been manufactured with traction and grip in mind. This allows you to work in any sort of dicey environment such as rain, mud, snow and ice. It has a shock-absorbent property as well to help keep the entirety of your foot comfortable and protected. The Carhartt Men’s CMF6366 6 Inch Composite Toe Boot is resistant to oil and chemicals so that it can take on any job you perform, no matter what. The string tie boot laces are durable and sturdy, so you can be sure they are always securely attaching the shoe to your foot. Made into a classic silhouette and cut with traditional work boot materials, the Danner Men’s Super Rain Forest Uninsulated Work Boot is the perfect work boot for those who value a combination of both functionality and style. This boot is made out of full grain leather that gives it a luxurious, durable appeal. The shaft of this boot features a mid-calf-rise design that provides security to the ankle without restricting your full range of motion in the process. These Danner work boots feature a comfortable, supportive Vibram sole, and the outsole provides the necessary detailing to make it grip onto any sort of terrain, making this work boot ideal for tackling jobs in any sort of environment. It has been triple stitched with ultra strong threading to help keep the shoe together using the exclusive Danner method of stitch-down construction. There is a pull tab on the back of the lace up boots that make them simple to put on. The Wolverine Nation Men’s DuraShocks CarbonMax 6 in. Boot is a work boot that provides all of the support that you need without being too bulky or heavy. This boot is crafted out of durable and supportive materials like its full leather rubber outsole. The rubber in this sole has been cut in such a way that it provides the utmost traction and stability with every step, making it ideal for work in rain, mud, sand, ice, and snow. It comes with a rounded toe that provides plenty of room for you to get comfortable. The boot features a padded ankle that provides all of the necessary support needed to keep you stable without inhibiting your full range of motion. 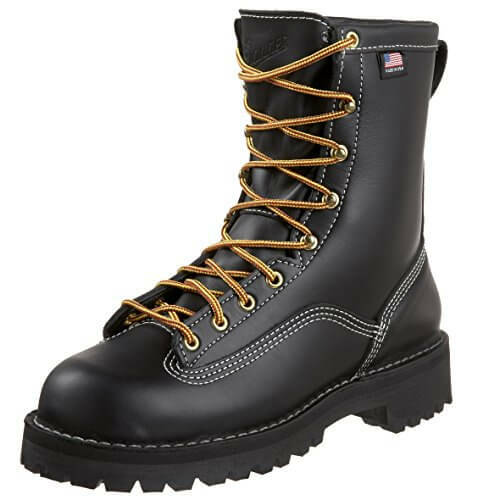 These Wolverine boots have a lace up design that makes it simple for you to get into the boot and out with ease after a long day of working in the elements on your job site. No-slip protection and total moisture wicking technology makes the Uplander Boot ideal for those who work outdoors in the snow, ice, rain, mud or other wet environment. The boots are made out of rugged, full grain heavyweight leather that has been oil tanned to give it depth and detail. There is an insole that conforms to your foot and is made of cork, which is responsible for the moisture wicking technology to keep you cool and dry, no matter how long you are working. The sealed seams also help to keep any sort of water from getting into the boot. The style features a lace up closure with speed ties at the top to make tying and hooking the laces onto the boot simple, providing you with total comfort. The Uplander Boots come with a Vibram rubber soles that provides total stability and support with every step you take. The sole also features a heel and grips to promote traction. Get your work done with style and sheer functionality thanks to the help of the Wolverine Men’s Raider Boot. This work boot is made of 100 percent genuine leather and comes in a handsome red and brown hues that makes it able to be paired with any sort of work attire. These boots feature a shaft that measures around 5.5 inches from the arch to provide you with unmatched stability and support around the ankle without inhibiting your range of motion. The ankle also has padding around it for that much more support. This shoe has durable rubber soles that can safely grip the terrain, no matter if you are working in snow, ice, rain, mud or sand. The soles are black to match the ankle padding. These lace up boots fit snugly and comfortably around the foot and come with speed lace up hooks at the top to make it simple to put on the shoe in the morning and take it back off again at home.